For most people smartphones have become an important tool for going on adventures. Most smartphones now include a camera, GPS functionality, music player, and a phone. The big benefit is significantly decreasing the amount of gadgets and electronics you need to take with you when adventuring. As smartphones keep getting smarter, the number of amazing GPS/tracker apps just keeps increasing. While, I haven’t used all of GPS apps out there (probably not possible), I have used 3 apps frequently for shorter duration adventures: Google My Tracks, Endomondo, and Strava. These apps work great for road cycling, mountain biking, or day hikes that are under 6 hours. Anything much longer and my phone will run out of juice. When I began mountain biking in North Carolina, I quickly realized I needed a GPS tracking app to track basic data. Plus, it’s nice to know where you’ve been and how to get back. I started with My Tracks because its ease of use and simple design. Moreover, it records only path, speed, distance, and elevation. My Tracks has almost no bells and whistles. There are no social media sharing option or sense of community. However, you can export your track as .gpx, .kml, or .tcx file, as well as watch your ride in Google Earth. If all you care about is tracking your own data, then this is probably the app for you. My Tracks is available on Android (there is a version available for iOS, buts not a Google Product). The next GPS app, I stumbled onto was Endomondo, mainly because it was more social oriented and tracks various sports (like running, cycling, and squash). You can share your activities on Facebook and your friends can watch your progress live. Plus, Endomondo records more data points: distance, duration, average and max speeds, calories, altitude, ascent, and descent. Another nice feature is the ability to integrate this app into 3rd party apps. If you use other apps like FitBit or MyFitnessPal, Endomondo will automatically export your data. Furthermore, if you use a Bluetooth enable heart rate monitor like FitBit’s, you can connect that with Endomondo as well. Finally, Endomondo host frequent challenges to push you to exercise more. I ended up upgrading to Endomondo Pro specifically for the battery saving mode. Unfortunately, this really didn’t work on my phone. It used pretty much the same amount of battery, while decreasing GPS accuracy. 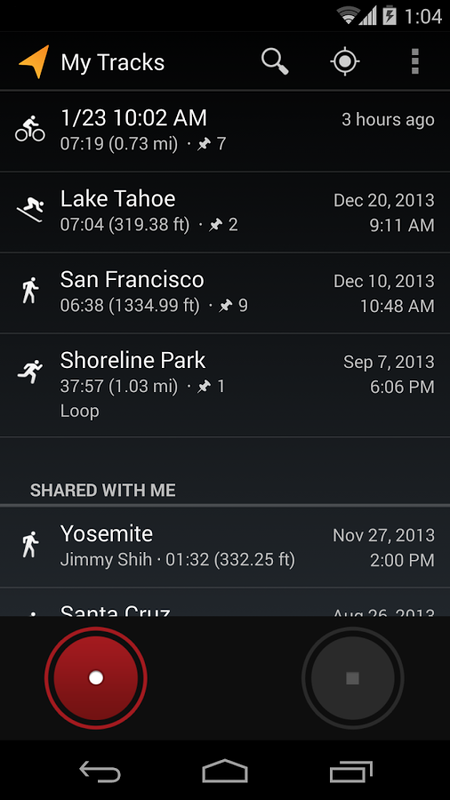 If you need an app that is social and integrates with many other apps, Endomondo is probably the GPS app for you. 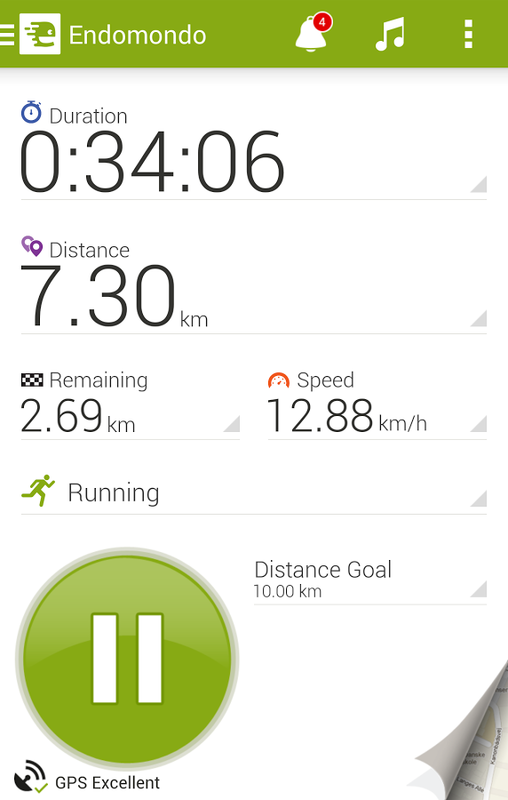 Endomondo is available on Android and iOS. I ended up using Strava because I liked the challenges and the king of the mountain (KOM) feature. Strava also tracks multiple activities, but not as many as Endomondo. Plus, it allows you to add the equipment you used, like which shoes you ran in or which bike you rode. Strava records a large amount of data: distance, total duration, moving duration, average and max speeds, calories, altitude, ascent, descent, and estimated power. Furthermore, Strava is very social. You can share your rides on social media, give kudos and interact with other users, and compete on segments against other Strava users. Specifically, the KOM feature shows your ranking against others who are riding/running the same trails you do. Finally, is great about combining data to show you weekly and yearly totals. Using Strava I was able to significantly decrease my ride times for multiple trails in my area because I could see how others were riding the trails. This forced me to push myself harder. In addition, I was able to compare my weekly and yearly stats to those I was competing against, which allowed me to spend more time on a bike. 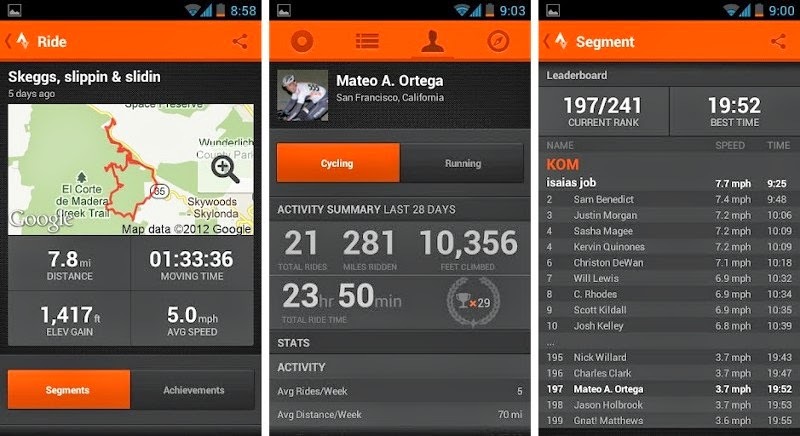 Strava is available on Android and iOS. If all you need is a simple GPS tracking app than My Tracks is likely your best option. If you like being social and integrating with 3rd party apps, then Endomondo is the way to go. If you are like me, data minded and a tad bit competitive, then Strava might work best for you. What other GPS apps have you used and which is your all-time favorite? If you like the blog, go ahead and follow us on Facebook. I have a Garmin watch somewhere. I should use it more often. On my phone I use the navigation app that came preinstalled.